Cleanliness is one of the basic tenets of firearm safety. Guns, when used, have a nasty tendency to become, well?nasty. 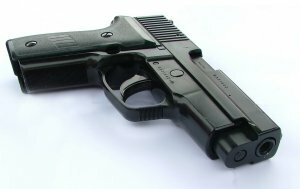 Hand guns, and other types of firearms require care and maintenance in order to operate properly, otherwise there could be some type of accident. Every type of gun requires its own method of cleaning, and if not done properly can cause damage to the weapon. Everything you need to know for cleaning firearms, from rifles to handguns, can be found here. The following articles are available for the 'Firearms' topic. Click the article''s title (shown in bold) to see the associated article. A clean shotgun will work better and be safer to use than one that is rarely or never maintained. Keep your weapon clean by following a few steps and using the right tools. Firearms are often fairly expensive, and the higher the quality of the firearm, the more the price goes up. As an expensive item, it only makes sense to learn how to properly take care of a gun. Luckily cleaning a gun barrel isn't all that difficult if you have the right tools. Cleaning your pistol will keep it in proper firing condition. When cleaning your handgun, remember to keep oil away from firing pin housing, as oil buildup will prevent your pistol from firing. Use solvents specially formulated for cleaning handguns, and remove ammunition from your gun into another room before dismantling it for cleaning. In order to preserve effective shooting and maintain safety, cleaning your rifle regularly is an absolute necessity. Remember to keep your ammunition separate from your rifle while cleaning, and have all of your cleaning equipment at hand before you begin. Never leave a rifle unattended, even if it is dismantled. When dismantling your shotgun, it is a good idea to place all of the parts you remove in one central location, possibly writing down notes as to where they go once you are ready to reassemble your gun. Cleaning a shotgun is not difficult if you follow the instructions carefully and practice common sense safety rules. Always keep your ammunition separate from your gun while cleaning it. After shooting a gun, remember that it is important to keep it clean. Get into a habit of cleaning your gun and have a cleaning kit available to make it convenient. How often do you take the time to clean your gun? Keep your weapon in the best possible condition by cleaning it on a regular basis. If you own a gun, you must maintain it correctly to ensure it continues to work the right way. Take time to clean your gun using a gun cleaning kit. If you own a rifle, you want it to keep it working correctly. Ensure that it does by cleaning it often.